The Creator Laptop Stand is the best DJ-orientated laptop stand we've used. And, at this price, we'd expect it to be! Excellent build quality, high level of adjustability, handy sub tray, easy setup and compact size when folded down. Made of aircraft-grade anodised aluminium, the Creator Laptop Stand has been designed with laptop DJs and performance musicians in mind. The feet and main tray fold totally flat (for storage in the included soft neoprene sleeve), and the whole thing takes seconds to erect: fold out and lock off the feet with the levered screw, then set the height of the main tray via the bushed socket, and angle, rotate (if required) and lock it. The unattached sub tray slots tightly into an angled groove in the stem. "The ability to angle and elevate the MacBook enabled us to get it exactly where we wanted"
We tried the Creator Laptop Stand in three setups. The first was with a 13" MacBook Air on the main tray and Novation's AudioHub 2x4 audio interface on the sub tray. The ability to angle and elevate the MacBook enabled us to get it exactly where we wanted it, but the stem of the stand restricted access to the interface's main outputs. 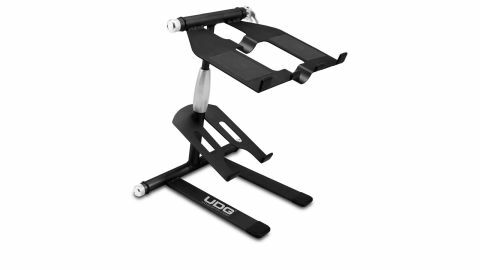 We can't blame UDG for Novation's rear panel layout, though, and rotating it 90 degrees solved the problem. Our second scenario saw the Stand's feet slotted under NI's Maschine Studio and the MacBook Air in the main tray at maximum height. Visibility of Maschine's screens was fine, although access to the back row of buttons was restricted - pulling it forward a bit fixed that. Obviously, the only way to use the secondary tray in this context is to swing it round 180 degrees to jut out backwards, keeping it relevant as a holder for anything you don't actually need to get your hands on easily: an external hard drive or audio interface, for example. Our final test placed Ableton Push on the main tray and the audio interface on the secondary tray. While this generally worked well, the stand wobbled a bit with spirited playing of Push's pads, although it was just a wobble - there was clearly no danger of anything actually collapsing.